Alana is a Science Fair Winner! I just had to share this with you. The science fair was today and out of 60 entries, Alana placed third and qualifies to go to the provincial science fair in Edmonton in April. But what thrilled her even more was the number of people who, after looking at her display, commented that they were never going to drink alcohol again (lots will not or will not be able to keep that promise but it meant a lot to her that they were saying it). What she did was take seven bowls, in each bowl she broke an egg, to the first she added nothing, 2 - milk, 3- distilled water, 4 - vodka, 5 beer, 6 wine and 7 cooking oil to demonstrate how destructive the alcohol was to the egg compared to the other substances - worked wonderfully! 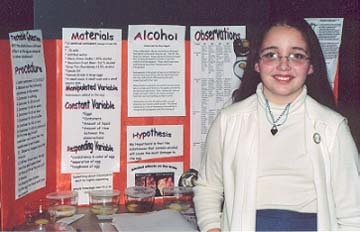 Several students wrote in their home journal that night that their favourite science fair project was the one on alcohol. A parent phoned me because her two sons want to make T-shirts with a picture of a brain superimposed on a heart with the slogan "If you love your brain... Say no to alcohol and drugs!" What thrilled her the most was the number of people who looked at her exhibit and then said, "Oh man, I am never going to drink alcohol again!" She was so excited by their reactions that she was dancing. It created a lot of dialogue around the school which I think was wonderful. Those little butterfly wings are fluttering and causing a tiny stir, at least here! I just got home from the local science fair where this year Alana place FIRST! with her experiment with alcohol and brain cells from a pig. One of the judges also judges at the National Competition and said that Alana's project was of the caliber that could win at the National Competition! She will compete the first weekend in April in Edmonton at the Regionals. Wooohooo! Alana's teacher was tickled when Alana presented to the class because of the discussion it sparked about drinking in general and drinking during pregnancy specifically. My Hypothesis is that the substances that contain alcohol will cause the most damage to the egg. 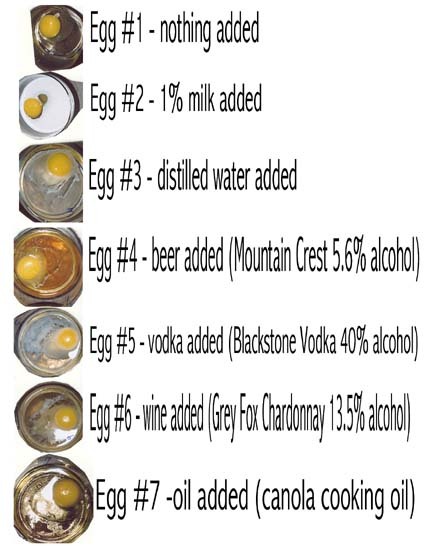 Will the alcohol have a different affect on the egg as compared to other substances? 12. After 4 hours pour the egg into the small square bowl. Yes. I was right. The alcohol does have a different effect than the other substances. It caused lots of white swirls in the albumen and it is only the containers that have the alcohol that the egg yolk is sticky and the membrane had turned to mush. The eggs exposed to alcohol broke down to a greater degree than those that were exposed to nothing, milk, water or oil. Although the eggs exposed to water had white “chains” in the albumen, this can be explained by the hydrophobic as well as hydrophilic properties of the eggs cells but the eggs exposed to water did not break down like those in the alcohol. Today, many people, like me, are trying to tell people that alcohol is the worst thing for you. Take Dr. Kim Nixon for instance. Doing a series of studies he found that drinking any amount of alcohol, at any time, inhibited the neurogenesis. These results have been confirmed by many other studies as well (see bibliography). Neurogenesis is the growth of new nerve cells born in certain brain areas, which, with the right health and nutrition, will migrate, differentiate and form connections with other cells. When alcohol is consumed, the central nervous system (which is made up of the brain, the spinal cord and the nerves) functions decline. First, intellectual, then our senses and motor control, and finally automatic functions, such as breathing and heart action. The most vulnerable to the brain damage caused by drinking alcohol is an unborn baby. Alcohol crosses the placenta freely and must then be metabolized by the baby’s underdeveloped liver. This often results in the baby floating in the alcohol long after the mother’s blood alcohol level has dropped to zero. In their report Alcohol Teratogenesis: Mechanisms of Damage and Strategies for Intervention, Goodlett et Al State: “More than 3 decades of human clinical research has provided direct evidence that alcohol during pregnancy produces permanent brain damage in the conceptus (baby) and associated life-long behavioural, social and cognitive disorders”. These individuals are diagnosed with Fetal Alcohol Spectrum Disorder or FASD. Ben Best, in his article Alcohol – Health Benefit or Hazard? , he discusses the health hazards and risks of brain damage from alcohol and he recommends “For those who highly value their brains/minds, this should be a matter of great concern”. 1.	mouth, 2. stomach, 3. small intestine, 4. heart, 5. brain, 6. liver. The brain is number 5 because the heart pumps the alcohol through the body including the brain. Different amounts or dosages cause different things like comas (at very high amounts), slurred speech and reduced coordination (lower amounts). You can usually tell if a person is drunk if they cannot walk properly. The police also carry an object called a breathalizer which measures the amount of alcohol in your blood. Even though many parts of the body are vulnerable, the brain is the most because alcohol is not digested like other food; it goes directly into the blood stream from the stomach and small intestine. Alcohol then melts into the water of our body and, vital organs, especially the brain, which contains large amounts of water, are more vulnerable to the effects of alcohol. In my experiment the egg represents a single cell, made mainly of amino acids or proteins, which is similar to our brain cells. There is a germinal disc attached to the yolk of the egg. This germ cell is the single cell from which life develops. Surrounding and protecting the egg is the white or albumen. The Chalazae anchors the yolk and keeps it from touching the shell as well as keeping the germ cell on the top. I hope that after my research more people will think twice before starting to drink alcohol. This past weekend was the regional science fair in Edmonton. The judging started at 10 went to noon, then a lunch break, then judging from 1 -3:30. When I went to have lunch with Alana she was quite excited because one of the judges is a professor of biology at the University of Alberta and she excitedly told me, "We have a lot in common, we both know a lot about FASD!" After the fair when Alana received her judging notes the professor had given her a perfect score, there were two more judges, another man who gave her almost perfect and then a woman who gave her not very good marks at all - interesting eh? Anyway the professor had written her a note that said, "You showed a great knowledge of problem from not only your research but life experience. All parts of society should know the damaging effects of alcohol and I think your experiement truly demonstrates a way we can educate people using your experiment." This year Alana did her project on Alcohol effects on Worm Behaviour. She took 72 worms (regular earthworms) and divided them into 12 terrariums. In three terrariums she soaked leaves and oatmeanl in vodka, in three, beer, in three juice and three just water. Her results were amazing. She researched "normal" worm behaviour. She found out that if you layer the terrarium with dirt, sand, leaves, dirt, sand, leaves, dirt sand leaves and put the worms on top they would burrow in and around and within three weeks everything would be mixed up evenly. That is what happened in the water. The vodka worms died within 10 days, the juice worms did not mix things up as thoroughly, but the beer worms hardly mixed things up and appeared to be very disorganized!?!?!?!? When she dumped the worms out to look at them and compare them I commented on how bloated and fatty the beer worms looked compared to the water or juice worms and Alana laughed and said "they have beer bellies!" At the Edmonton Science Fair she was interviewed by the Edmonton Journal. When the reporter asked her what the conclusion to her project was she stated "Alcohol causes abnormal behaviour in worms just like it does in humans" Another person came up and looked at her project and said "cool ,you got the worms drunk!" Alana just glared at him and said "I have personal experience with the damage alcohol causes and I don't happen to think that getting anything drunk is funny!" The guy apologized and left. Alana received an honourable mention this year but there were four other students doing their projects on alcohol and/or FASD, one of whom was her younger brother Brian who did his on Alcohol and Bean Plants and focussed on the effects of alcohol on living cells and it relation to cancer. I told Alana she had started a trend! Congratulations, Alana, on a job well done!